This post is sponsored by Nestlé and Buitoni as part of the Balance Your Plate initiative. As always, all opinions are my own. Thank you for supporting the brands that keep Lively Table running! For as long as I can remember, eating dinner together as a family has always been an important part of my day – every single day – which is why I’m super excited to celebrate Family Meals Month this September! Growing up, dinner was a time for my family to be together over a good meal. It might have been the only time we all saw each other all day. Whether my mom cooked, which was most of the time, or we picked up takeout from a local restaurant, we always made an effort to eat together when we could. Fast forward to college when I met Mr. Table. Since the very beginning, we ate dinner together almost every night. Sometimes he would take me on a dinner date, and sometimes I’d go to his house and cook. But we almost never missed a dinner together in the almost four years that we dated, and it was a time we both truly cherished. Research has shown many benefits of shared meals. For me, eating dinner as a family is an important time to communicate and foster relationships, but it’s also such a big opportunity to model healthy behaviors with food. This is why I plan to use the time to teach my kids how to eat intuitively and trust their bodies. By role modeling balanced eating patterns and prompting fruitful conversations (free from topics on body weight and “good” and “bad” food labels), family dinner is a great tool to establish healthy relationships from the start. 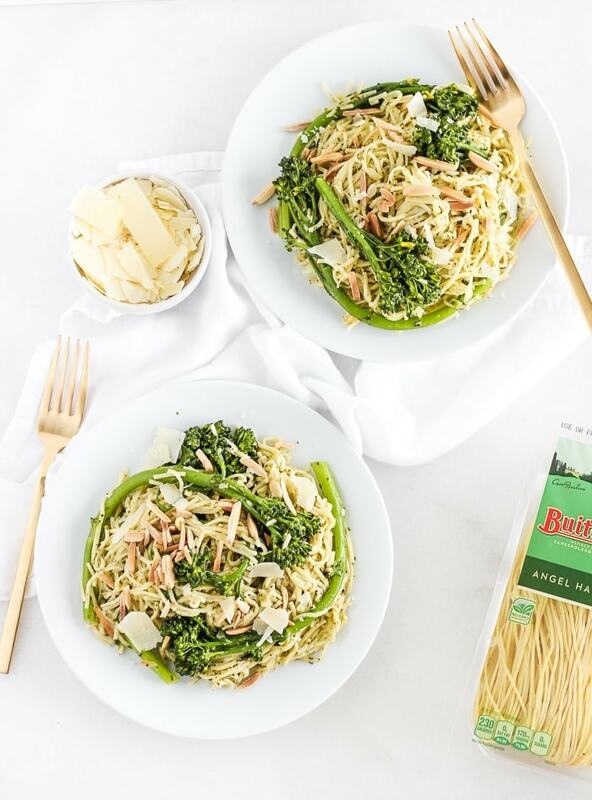 Buitoni Angel Hair Pasta + veggies (broccoli) + protein (almonds) + yummy flavors (Buitoni Pesto + Parmesan cheese) = a balanced plate. 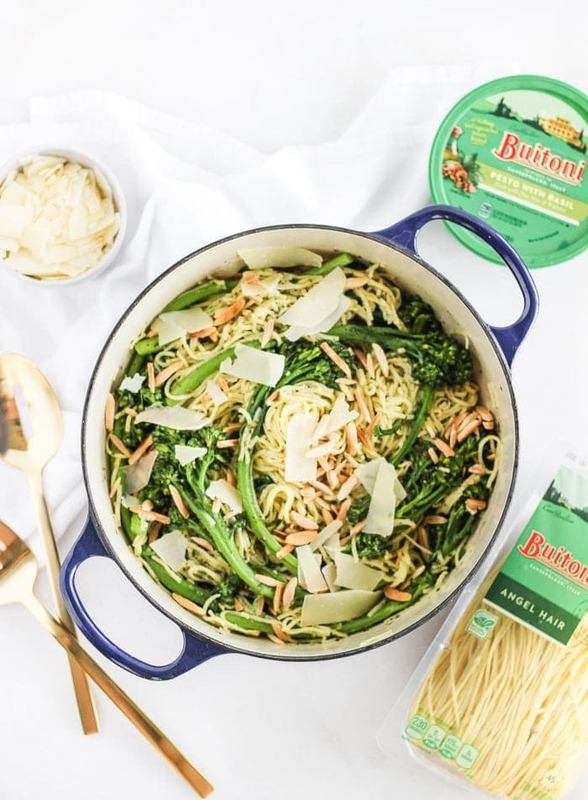 With Buitoni, it’s easy to create a delicious meal that’s perfectly balanced with veggies (or fruit), protein, healthy fat, and carbohydrates. 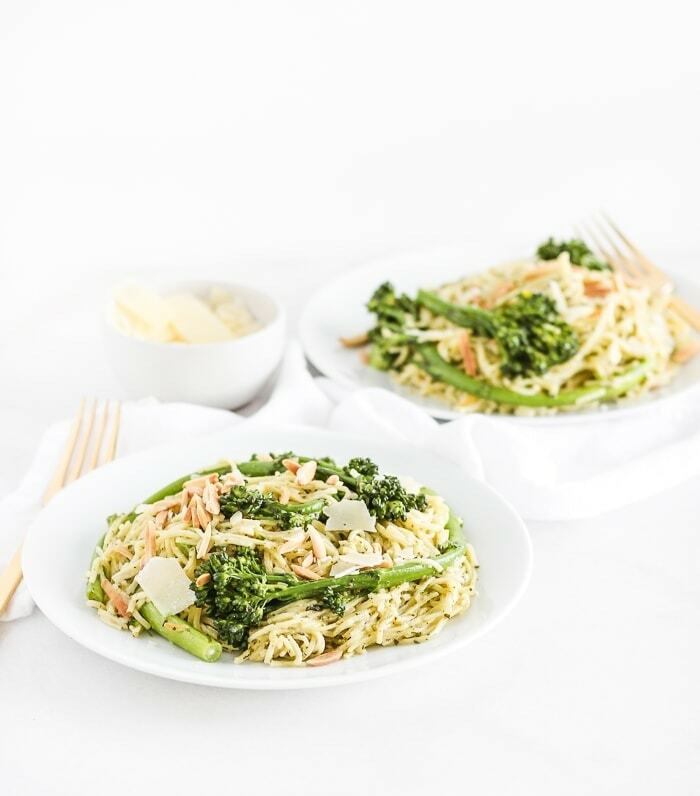 All I had to do was add a bunch of fresh broccoli (I used baby broccoli because Mr. Table likes it better), toasted almonds, and freshly shaved parmesan to the cooked pasta, stir in some pesto, and I had a complete, balanced meal ready to go in no time! As with most super simple dinners, quality ingredients make a huge difference in creating a more delicious meal. That’s why I love Buitoni refrigerated pasta and sauces. They’re made with simple, high quality ingredients for freshness and flavor. 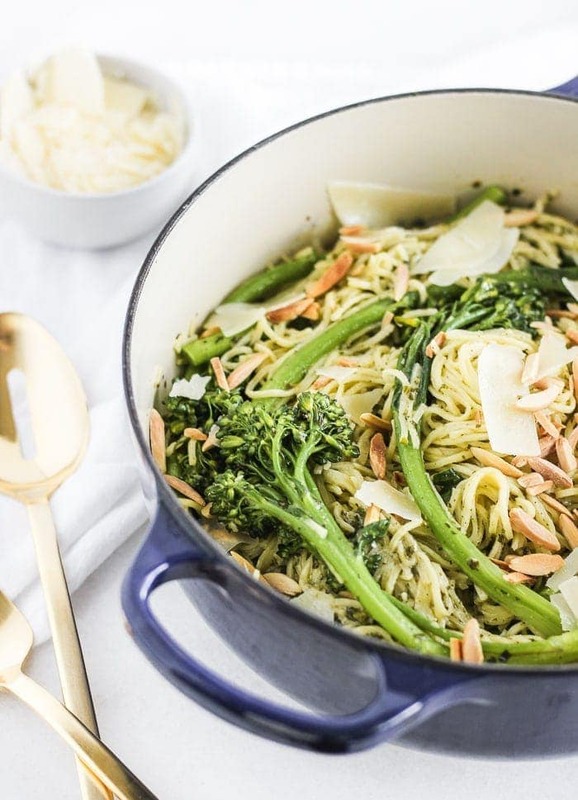 Buying the best Parmesan you can find and a big, beautiful crown of broccoli will help make this broccoli pesto pasta almondine truly spectacular. 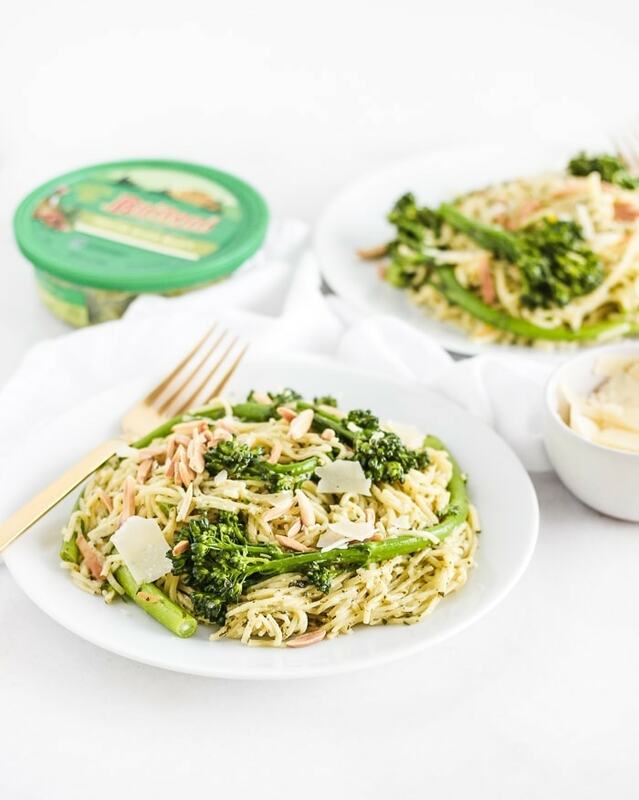 If you want some extra protein in this broccoli pesto pasta almondine, add in a can of cooked, warmed chickpeas or some leftover chicken or fish. 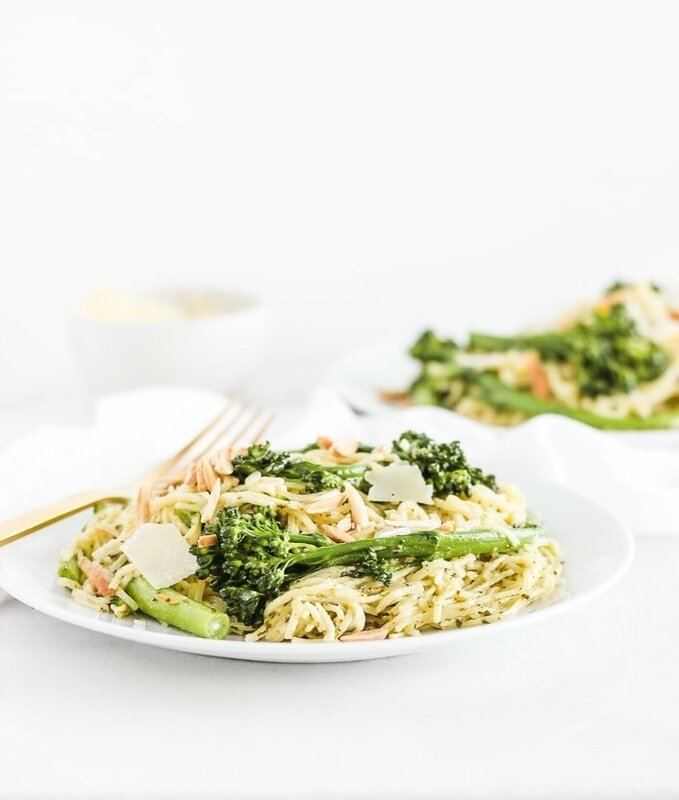 Then gather ‘round the table for an easy dinner this Family Meals Month! Cut broccoli into florets, or if using broccolini, trim ends. Heat oven to 400°F. Spread almonds into a single layer on a baking sheet. Toast for 5 minutes, watching carefully so that they don’t burn. Remove from oven. Fill a large pot with water and bring to a boil. Add oil, pasta and broccoli. Gently boil for 1 1/2 to 2 minutes, or until pasta is al dente. Drain, reserving 1 cup of cooking water. Place pasta and broccoli back on the stove over the lowest heat setting. Add the pesto and gently toss, adding pasta cooking water as needed to create a sauce. Plate pasta and top with almonds and Parmesan. Visit the Balance Your Plate website at www.nestleusa.com/balance and Pinterest board at www.pinterest.com/balanceplate/ for more quick and nutritious meal inspiration and ideas! This looks delicious, Kaleigh! I can’t believe how easy it is! Dinner time was always important in our family growing up too and I make it important with my own family today. It’s such a great time to catch up with each other. 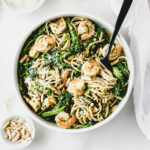 This pasta dish looks amazing, I can’t believe it only takes 15 minutes.